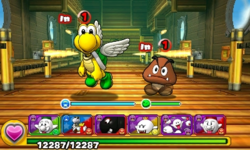 World 1- Airship is the ninth and final course of World 1 in Puzzle & Dragons: Super Mario Bros. Edition. It is a basic, airship level with enemies consisting of Goombas, Paragoombas, Green Koopa Paratroopas, Flame Chomps, and a second boss fight with Larry Koopa. Clearing this course unlocks Ice Mario and Ice Luigi as Leaders. This level is straightforward, consisting of four battles and Larry Koopa for the boss fight (if the player already has Larry as a teammate by clearing ★World 1- Airship, they fight 2-Goomba Tower instead). The player has Fire, Water, Wood, Light, and Heart Orbs on the Orb field for this course. ★World 1- Airship is a difficult version of World 1- Airship from ★World 1, with Dark Orbs now appearing on the Orb field. Clearing this course unlocks Larry as a teammate, and Statue Mario as a Leader. 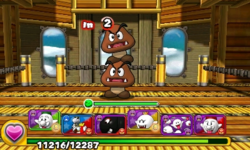 2-Goomba Tower, replacing Larry as the boss of World 1- Airship. This page was last edited on June 24, 2018, at 12:31.